The Wedding Cake - made the central point of the wedding reception. Long before Martha Stewart the southerners were making a statement using the wedding cake. Set on a table with beautiful heirloom linens surrounded by flowers, for all to admire. Originally a symbol of fertility and feeding each other was the first act the bride and groom did together as a married couple. 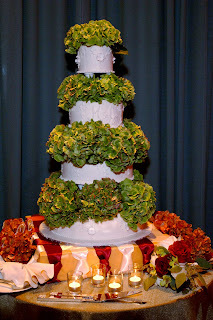 Recently many brides felt the cake was an afterthought, just something they have to have. I think the importance of the cake is coming back around, more and more brides are caring about how it tastes and making sure it is decorated a bit over the top and matches the rest of the reception decor. In reading the book I was reminded about the history of the wedding cake. It was customary to send the guests home with a piece of cake in little boxes wrapped up in a bow. For little girls this was very exciting - they would go home and put it under their pillow for good luck.